In the heart of South Delhi, spread over 12000 sq. ft, O Palacio is a serene Portuguese getaway from the bustling streets of New Delhi. 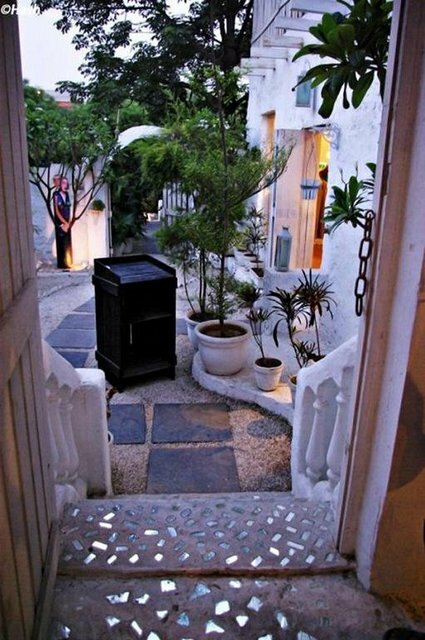 An inspiring white walled villa with 3 beautifully designed Guest Rooms, an Art Gallery showcasing various art forms like photography, world cinema, world music etc, a Clothing Design Studio, an open air Fine Dining Restaurant serving international grills, O Palacio is an interactive quaint little place for you to stay. Architecturally designed with various levels with open courtyards, a banyan tree right in the midst of it, flooring laid with white pebbles, O Palacio has 3 beautiful rooms to offers to its discerning guest. O Palacio named as must see places by “CNN” and “New York times”, we welcome you to come and be a part of our creative journey in making O Palacio a true cultural hub…..
What to see & do : just sit in our various courtyard and enjoy the serene environment. across the complex a district center for shopping and leisure.